Every game room, garage or man Cave could use the addition of a customized neon clock. So why not add one to your collection this impressive clock has not just one but two neon rings. 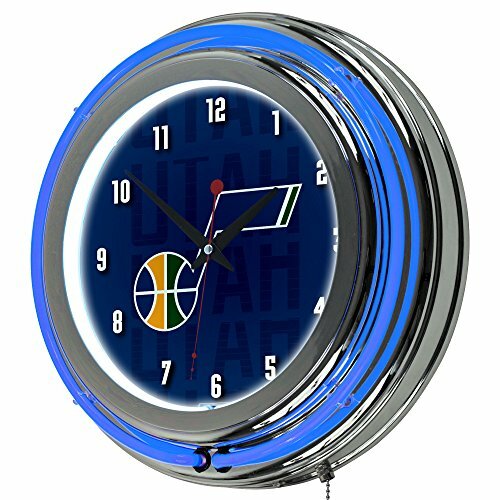 It has an accent colored neon ring on the exterior and a brilliant white neon ring on the interior of the clock to light up your custom logo. Other highlights include chrome finished Resin housing and a high grade glass clock face cover. The battery operated quartz clock mechanism will keep your new prize precise and ticking for a long time, while the neon runs off the included AC adapter. The neon is controlled by the pull chain and the back of the clock includes a wall hanging mount. The 3 inch depth of this clock combined with the radiant shimmer of the neon reflecting off the chrome housing is sure to make it pop off of any wall. Bring style and function to your game room, garage or collection with a custom double ringed neon clock. Four color digitally printed logo vinyl application: indoor/outdoor six mil. Vinyl, live area: 9.25"X 9.25"
AC power Adapter with 6' cord, wall hanging mount, dimensions: 3" x 14.5" x 14.5"
NBA Houston Rockets Single Shade Gameroom Lamp, 14"